I’m having problems with Twitter. A few months ago I had it setup correctly and working as intended. The project hasn’t been running for a while and while testing my code today I couldn’t get Blynk to tweet. In my opinion I tried to change everything I could and the problem has to lie within the Blynk app / Twitter widget. I’m using a Controllino (based on Arduino MEGA) with in build Ethernet shield. Tried with Android 6.0 (tablet), 8.0 (phone) and IOS (iPhone). Edit: Removed some data from sketch because of privacy. Also trying to use Superchart to log data instead of Twitter as a work around. In fact this shouldn’t be in the loop at all anyhow, even with the if() logic. Use a separate function for timed control when sending your tweets. Thanks for responding. As stated I made a snippet of my code to test it out. The original code is much more complex and did contain the timestamp and time limitation by default. This code only tweets once (see boolean “Tweeted”) so both of your suggestions are not needed. EDIT: Just to be clear; this tweet has never been send and thus is unique! I appreciate the fact that you took the time to respond, but your response doesn’t really help for the question asked. I changed the code following your advice but the problem still occurs. Just to be clear; this tweet has never been send and thus is unique! This is only “clear” now But even so, it is a poor way to test when you could easily add in some random or incrementing number to be sure you are not violating some twitter limitation. Basically it looks suspicious, so I questioned it. And even your “new” code can clearly be reset via a button, to resend the exact same tweet… so how can you really be sure that isn’t the issue? But seriously, I obviously don’t have your account, so can’t test your settings, and can only give out suggestions based on the data you provide and what code I see. This is also not clear… did you properly setup the twitter widget on the phone that is running the project? I understand your reasoning but since I mentioned “use a timestamp to make every tweet unique” I thought it would be clear that I undestand the Twitter policy. I will make sure to be more specific next time. Because no tweets are send at all from Blynk. The original complete code functioned before and even when I change the hardcoded timestamp nothing happens. It doesn’t matter what unique text I use. I was pretty specific in my post and was under the presumption that if read carefully your questions would be obsolete. The fact that I put something in the loop has nothing to do with the problem as described because as I said, it worked properly before; 25k+ tweets have been send with the original complete code. In hindsight I should’ve mentioned this in my OP. Yes. Tried it countless times with a couple of phones and a tablet and even a brand new account. I expected it to work since it did before (didn’t change anything on my first test) but when it didn’t I started trying different methods without succes. I’m well aware that my response might look grumpy or ungrateful and would like to imply once again that I do really appreciate your help. I understand that you get alot of ‘dumb’ questions and thats why you are asking these (seemingly) basic questions. I did alot of troubleshooting already and did my best to state this in the OP. I implemented Superchart as a data logger which is a better solution in some aspects, so there’s no urgent need for a solution anymore. It is interesting to tackle this problem nonetheless i.m.o. Thanks again Gunner, without people like you this community wouldn’t be what it is and while this is my first post I’ve read alot of topics to solve my problems. Something for the devs to deal with I guess… @Dmitriy ? PS very hard to search the forum for twitter issues since the keyword twitter shows up in sooo many example sketches so this issue may already be well known?? Had the same issue while searching! But since there were no recent entries with Twitter being the main concern I thought I’d make a post. Will check again if the devs come up with an answer, but as said before I don’t really need a fix anymore since I’m using Superchart as a better alternative. Confirmed. Twitter widget still not worked with new Library 0.6.0. Twitter on local server - any progress? Hi. This is rarely used feature so we have no plans to make it work. Sorry all. Since Blynk collects the stats from Cloud users, not Local Server users, I would guess this means no more tweeting from Blynk for the indefinite future. Actually, I’m connect with cloud server. E-mail and Notify works OK, but twitter broken. Not worked too with twitter and OK with E-mail. Bumped, Twitter widget is dead. 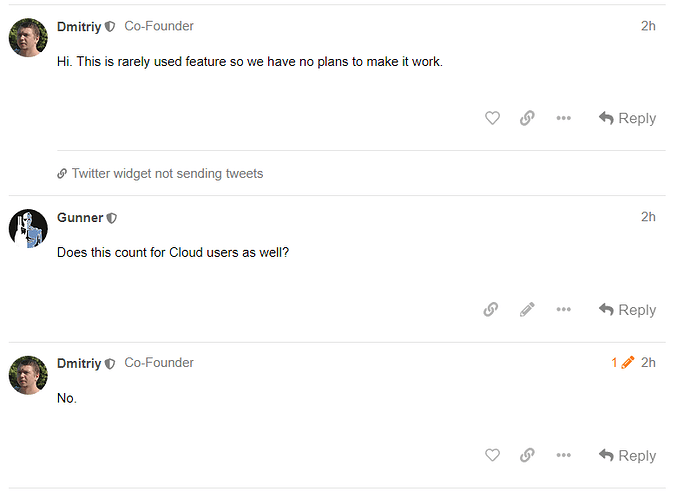 @Gunner, I hate to bring this up again, but when @Dmitriy said they have no plans to make the Twitter Widget work and you asked if this included the Twitter Widget working with the Cloud Server and @Dmitriy said, “No” … can I take this to mean they plan to fix the Twitter Widget in conjunction with the Cloud Server? Has there been any further discussion regarding a bug fix in the last few weeks I may have missed? can I take this to mean they plan to fix the Twitter Widget in conjunction with the Cloud Server? I haven’t a clue how to interpret some of Dmitriy’s answers I don’t clearly recall any follow up commentary… but I suspect twitter may be one of those “soon to be dropped” options from Blynk’s beginnings. @Gunner for BLE/BT Blynk.tweet (and, probably, Blynk.mail) will work in same way as Blynk.notify, so it is not about twitter widget in its ordinary way. OK… so Blynk can still use twitter?? It is just that a few people have ran into issues (using Cloud) tryng to do so, that havent been resolved… or even officially looked at. AKA this topic for one. Again, I am not going to test it anymore myself … so I will leave this issue as is for others to work on. But thanks. I mean that the update I’ve uploaded to beta is not about sending tweets to twitter. It just handle the tweet/notify request from BLE/BT hardware and shows an alert with their message, nothing connected to twitter. But rather that post was just saying that notification (and apperenly twitter) calls in the sketch will now register on the phone in BT/BLE connection mode now, just as it did in other WiFi, ethernet, etc. modes. Sorry to confuse this OPs issue then. @BlynkAndroidDev, Would you please talk to @Dmitriy and find out whether Twitter Widget + Cloud Server is dead or whether the bug will be fixed.